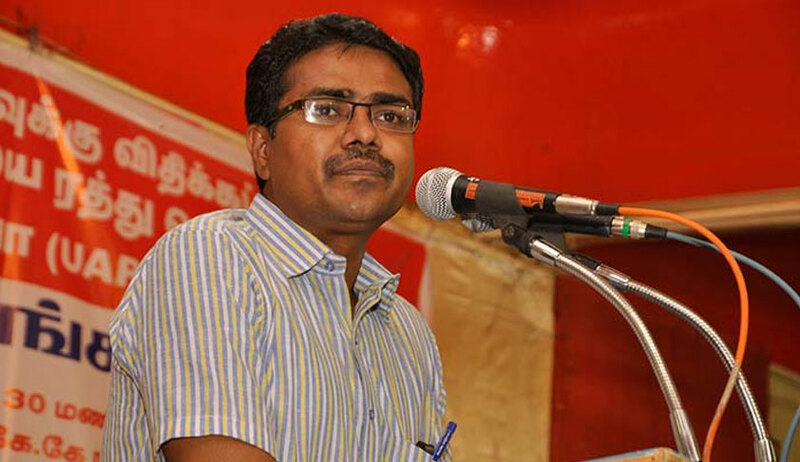 The Indian Association of People’s lawyers (IAPL) has condemned the arrest of Advocate Vanchinathan by the Chennai police in connection with the anti-Sterlite protests . According to reports, Mr. Vanchinathan has been actively involved in the protests against the copper smelter since June, 2017. The Advocate has reportedly been a key person in the protests, having provided legal support alongside Advocates Hariragavan and Rajesh of Pandarampatti. The police however now allege that he indulged in the violence that ensued during the 22 May rally to besiege the Thoothukudi collectorate demanding permanent closure of the plant. During the rally, the police had opened fire at the protestors, killing thirteen people. This had prompted the state government to permanently shut down the plant days later. Consequently, he has been booked along with seven others under Sections 147, 148, 188, 353, 506(ll) of the Indian Penal Code and 30F of Tamil Nadu Property Prevention of Damage and Loss Act (TNPPDLA) for vandalising barricades, resisting police and torching vehicles. The Madurai Bench of the Madras High Court had initially directed the police to refrain from arresting Advocates Vanchinathan and Hari Raghavan till the hearing of their anticipatory bail application, and had demanded that the Police produce material evidence that the two "engineered" the violence. However, on 18 June, the Court dismissed the anticipatory bail filed by the two lawyers, stating that they cannot avoid interrogation. In a release issued on Thursday, the IAPL now alleges that the the lawyer was arrested in order to discourage other lawyers from appearing in the case, stating, "The arrest of Vanchinathan and continued intimidation of other lawyers by Tamilnadu police who helped file cases against Sterlite is vindictive, cowardly and an indefensible act. These arrests are intended to produce a chilling effect to scare other lawyers from appearing in sensitive cases challenging undemocratic and anti-constitutional policies and actions of the government." IAPL asserts that Mr. Vanchinathan and other lawyers were present in Tuticorin on the day of the protests to provide legal assistance and to facilitate talks with Government representatives. The arrest has in fact been alleged to be a part of the "authoritarian and coldly calculated actions of the Tamilnadu government to break down anti-Sterlite protests and smother the voice of people". The release finally states that arrest of lawyers fighting for the people is the latest trend being witnessed throughout the country, asserting, "All over India - in Bhangor (WB), Tuticorin (TN), Jagatsinghpur (Odisha), Raigarh (Chhattisgarh), Sanand (Gujarat), Singbhum (Jharkhand) or Gadchiroli (Maharashtra) – affected people and activists protesting against corporate land grab and environmental devastation are being attacked, implicated in false cases, and arrested under draconian laws. The latest trend in this is to attack the people’s lawyers who are trying to fight corporates whether as labour lawyers, environmental lawyers or lawyers challenging land acquisition and denial of tribal rights."